This article will show you how to repair your credit as quickly as possible in 4 simple steps and it shouldn’t cost you a penny. The steps are simple, but they can take some time to accomplish. Remember that you didn’t damage your credit overnight, and you won’t repair it overnight. You can usually make drastic improvements in your credit in as little as three months by following my plan, and the worse your credit it, the easier it usually is to improve! 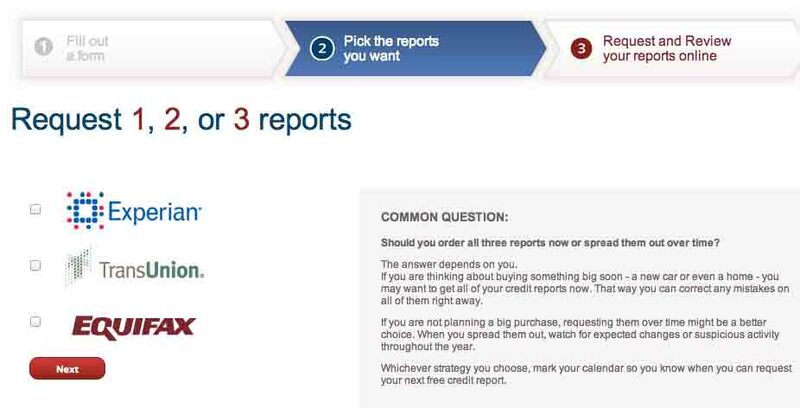 Step 1: Get free copies of your credit report from the three main credit bureaus. There are three main credit bureaus (businesses that keep track of your payment history with creditors): Equifax, Experian, and Transunion. Each of them have their own version of your credit history and they will almost always contain different information. This is because some creditors only report to one bureau since they have to pay to do so and they want to minimize their cost. You can request the reports online and if you are able to answer their security questions then you should be able to view it online as well. The US government passed a law that you are eligible for a free copy of your credit report once a year from each of the bureaus and set up a web site to help make it easy. It actually works quite well, but you will need to do from a computer, not your smartphone for best results. 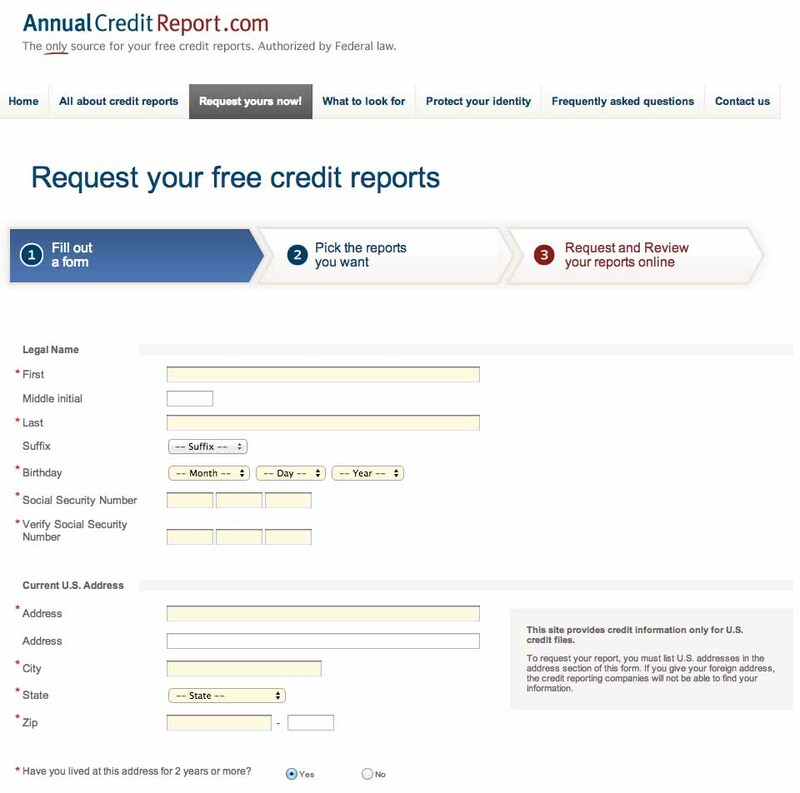 Click here for AnnualCreditReport.com and select the big reg button to get started. On the next page you will need to put in your name, your date of birth, your social security number, your current address, and your previous address if at your current address for less than 2 years. Here is a screen shot of the form. Then on the next page, select all three checkboxes so you can get copies from all three bureaus. Each one will has its own process and will open in the same window with a banner along the top that will take you back to annualcreditreport.com when you are done. The instructions for each bureau are pretty straightforward so I will not go over them here, but basically you verify the information you provided, then they ask you some security verification questions to make sure it is really you and not someone trying to steal your identity. This might be the amount of a car payment, an address you used to live at, the name of a previous creditor or some other information from your credit report. Just answer the questions the best you can and don’t be afraid to say “I don’t recognize this account” because they ask about accounts that don’t exist sometimes too as a security feature. If you answer the questions correctly, then they will show you a copy of your credit report online! If you don’t answer the questions right or there is some other problem, you won’t be able to view it online right now, and will have to request it by mail. If you have to do it by mail, follow the instructions they give and mail it right now! Once you get the copy in the mail, you should be able to do all of the future steps online. They will have you create an account online so you can view you report and dispute in the future so make sure to write down your login information because you will need this again in this process! I suggest you print or save a copy of your reports so that you can review them later. Sometimes, you will be able to answer the security questions of one bureau but not another, so don’t be discouraged if you have to mail in the first one, just print out the form they provide, mail it in then try the next bureau. Go ahead and get started on the ones you can access online while you are waiting on any that you have to request by mail. If there is no information on your file (“No Credit”) or there is no adverse (negative) information, then you don’t need this section. But if you have any negative entries on any of your reports, then go onto step 2. Step 2: Remove all incorrect names and addresses from your reports by disputing them on each of the three bureaus. This step is important because many of your old and often incorrect bad accounts may be tied to an old addresses that are still on your credit report. If that old address is still on your credit report, it will be much easier for the creditors to verify the bad accounts. We want to get the bad accounts removed, so we have to make it harder for them to match up the accounts. What you want to do is dispute any names and addresses on the account even if they are accurate except for the one correct version of your name and your current address and your previous address. For example, if your name is John James Smith, then you might have names listed as John Smith, John S Smith, J S Smith, and John James Smith. If I normally apply for credit under John Smith, I will dispute all of the names as incorrect except for John Smith. Some of the bureaus won’t let you dispute names online, if so just dispute the addresses. Here is what the “Update Address” section looks like on Transunion, but each bureau will look a bit different. Delete any addresses except your current address and your prior address and make sure you current address is showing as the primary address. There may be a number of different addresses or variations of your address (such as 123 Red Ave Apt 7 and 123 Red Ave #7). You want to remove EVERYTHING except for the preferred listing of your current address and the preferred listing of your previous address (if at current address less than 2 years). All of this is to 1) make your report more correct and 2) Make it harder for your bad creditors to match your accounts after we dispute them in step 3. Removing incorrect names and addresses is normally a quick process and should be done in a few days, although it can take up to a month to process. Step 3: Dispute any negative or adverse accounts. There are a number of different negative accounts that can be on your reports. Collections or judgments from medical bills, charge offs for unpaid credit cards, late payments on car payments, student loans, or credit cards, etc. If you have any accounts showing up as negative or adverse, the process is going to be the same. The most effective way to remove these items is a multi phased dispute process. This process will be the same for any negative items, whether the information is correct or incorrect. Our goal is to get the items off your report in the quickest manner possible. The way the dispute process works by law is as follows. When you dispute an item from your report, then credit bureau contacts the creditor and requests verification of the information. The creditor then has 30 days to prove that the debt is yours and the status is correct. If they don’t respond within 30 days, then they have to remove the entry! So we take advantage of this by repeatedly disputing on different grounds until they don’t respond in time. 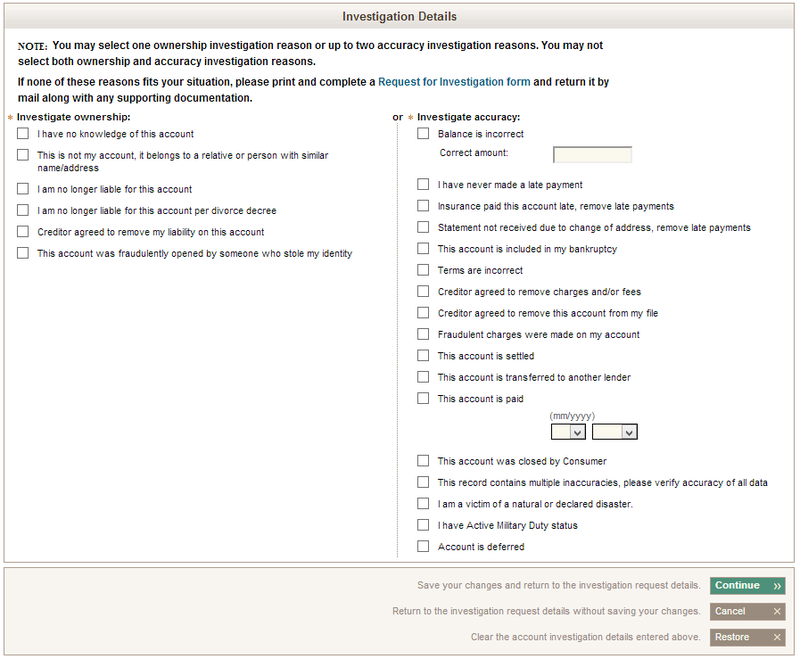 For each adverse or unsatisfactory entry, we want to first dispute it as “I have no knowledge of this account.” Here is what the dispute screen looks like on Transunion, although they are all similar. If you have never disputed before, expect 30-40% of your negative items to be removed within 30 days from this simple step! This is especially true with collections since collection agencies typically only get a debt for a period of 60 or 90 days to try to collect, then pass it onto another agency. Since they no longer get paid on the account, there is no reason for them to verify the debt and it will be removed! Once your investigation results come back (in about 30 days), you will be able to view a new copy of your report, hopefully with less negative items on it. Once that happens, you will repeat the dispute process, but this time select “This is not my account. It belongs to a relative or person with a similar name / address”. Another 30 day process happens and they will have to verify that it is your account and not a relative or similar person. Once your investigation results come back (in another 30 days), there will hopefully be less negative items on it. Then you repeat the dispute process, but this time select “Balance is incorrect,” or “I have never made a late payment” for each negative account. Don’t select “Someone stole my identity” though unless that really happened because that can put your credit file into a fraud alert state that won’t allow online access and is basically a big hassle. I think you are getting the idea. You basically keep disputing the items for different reasons until the creditor either messes up and doesn’t respond in time, or gives up. You may get lucky and all of your negatives get removed after the first round, but it usually takes multiple disputes to remove everything. If after 4 or 5 disputes the negative items are still on there (or they start saying your disputes are “frivolous”) then you can move onto step 4. By this point, you should only have a few items left, but ones that are not going to go away easily. This might be a collection agency or judgment. First off, check the age on the item. All items over 7 years old will automatically expire from your report automatically, so if it is close to going off on it’s own, leave it alone. But if it is more recent, then you will still need to deal with it. Let’s use an example of a collection for a hospital bill for $500 that keeps verifying the debt. Save up $250-300 and then call the agency and tell them that you will settle the debt for $250 if they agree to remove it from your credit report. Since they get paid on amounts they collect, they will often agree to do this! Try and get everything in writing and wait until you have the money together to contact them. Note that a paid collection is just about as bad on your credit report as an unpaid collection. So if you can’t get the money together to settle the debt and get them to agree to remove it, then it may be better to keep disputing it. These are just the basic steps and there are a number of advanced steps you can take involving registered mail, FDCPA violations, and HIPAA violations to get really tricky items off your report. If you are ready for the advanced steps, then head on over to CreditNet.com and start reading! This thread is a good start! There you have it! At this point, your credit score should be way up from where it was and you might be ready for the Easy Quarter Million! Go back through our Getting Started page and check your score again with Credit Sesame. If you have no credit items at all after the removals, then you might have to get a card like the Student Discover to help you establish your credit for 6 months or so and build your credit. Reply here in a comment with any questions and I will try to answer them.